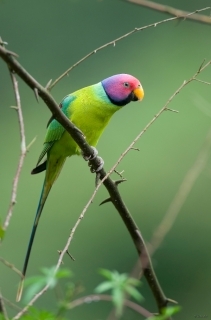 The Plum-headed Parakeet can be housed in a spacious flight with non-aggressive softbills or finches. Male-body colour in general yellow/green; head deep red in colour, washed with blue/purple on hindcrown to nape and lower cheeks; black chin strap and wide stripe across lower cheeks, extending as narrow line round hindneck and bordered below by broad blue/green collar; dark red spot on inner median wing coverts; long centre tail feathers deep blue tipped with white, the side tail feathers yellow/green tipped with yellow. Upper mandible orange/yellow, lower brown/black. Eye yellow/white. Female-dull blue/grey head; variable yellow collar replacing black marks present in male; red shoulder spot absent. Upper mandible pale yellow, lower grey. As in female but with green head, pale orange frontal band; short tail. Bill yellow. Red shoulder spot absent. Eye grey. Flight call distinctive: toowinck-toowinck. More musical than ring-necked. Male song complicated; consists of sequence of rising and falling notes. Chattering and rapid shrill notes reported. Alarm calls scolding. Encyclopedia of Caged and Aviary Birds, Alderton, 2002. Walk-in aviary minimum length 3m (9.8 ft). Soaked or sprouted sunflower, mixture of small seeds: canary, millet and smaller amounts of oats, buckwheat and safflower; spray millet, green leaves, rearing food made from: hard-boiled egg, wholegrain bread and carrot, all ground to crumbly consistency; fruit especially apple, and others. Swings, bird-safe chewable wood such as fir, pine, willow and elder, and heat sterilized pine cones, ladders, vegetable tanned leather toys, foot toys, climbing ropes, bathing, push and pull toys. Decline in Sri Lanka due to habitat loss. Also has declined in Kathmandu valley, Nepal. Lower Himalayan hills from NE Pakistan across to Nepal, Bhutan and West Bengal. Almost all of India and Sri Lanka and Rameswaram Island. Occurs in woodland and farmland and in plains and foothills. Forests include: moist deciduous, sal Shorea forest and subtropical pine stands. Favours terrain generally below 500m (1640 ft) but locally up to 1500m (4920 ft). Feeds on shrub flowers, wild pomegranate, nectar, grain including sorghum and maize, figs, apricots, red peppers and thistle seeds. Also bamboo seeds in Bandhavgrh National Park. Forages in mixed flocks with Slaty-headed and Malabar parakeets. Often breeds in colonies. Male territorial. 4 to 5 spherical eggs, 25.0 x 20.0mm (1 x 0.8 in). December/January-April, sometimes July-August in Sri Lanka.